I definitely have a love affair with vintage picture frames. They are so beautiful on their own, upcycled with some paint, used to frame old or new photos or prints, or repurposed into chalk boards. I often buy old prints at auction because I love the frame. Here, they have used a combination of old trays, plates and frames. and yes, old frames make great chalkboards. As a photography nut I cannot help but adore ANY frame -- especially the vintage frame with so much character! 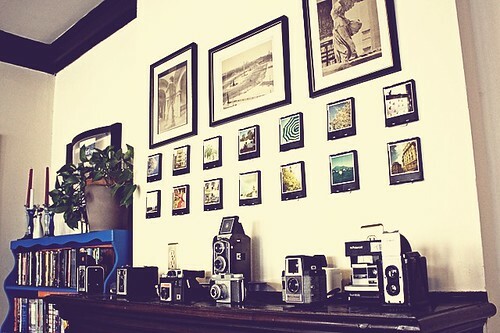 Diggin' the camera collection as well! Returning your follow -- your blog is lovely! Love the pictures and especially the chalkboard! I have thought of doing that! Thanks for visiting my blog! I look forward to getting to know you through this blogging world! Oh, I love frames! I really like the "modern" one without pictures and the way the lamp is "framed" within one! But I don't think I'd have the nerve to do that myself!! Thanks for stopping by the blog today. You never know who you're going to find through the link lists. I love your photos. I'm looking forward to reading more of your blog. I love antiques as well. Thanks for the follow. I can tell that your blog is going to cause me to do a lot of drooling. I'll try to keep a towel handy! Following you, too! Hi, love your blog, it's amazing. I am a new follower from the Hop, I hope you will have a chance to check my blog back and follow too. I love vintage photos, my house is full of people I do not know because I have been drawn to purchasing the photos. Thank you for the new ideas.